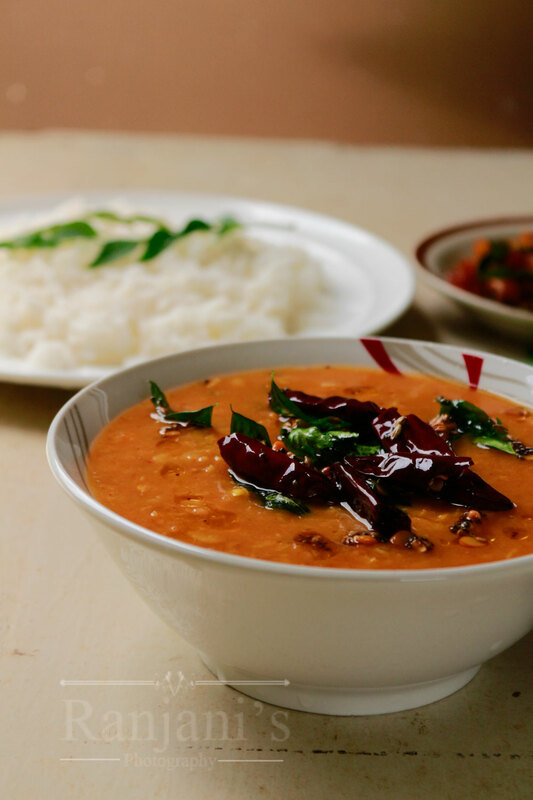 Andhra tomato dal / Andhra tomato Pappu – a traditional recipe of Andhra cuisine. This lightly tangy Pappu is a variation of usual spicy flavors of Andhra recipes. Dal is a common recipe of Indian cuisine and the cooking method varies from state to state. In Andhra, they will add little tamarind while making tomato dal. I am not so tangy person so I didn’t add tamarind. This simple Pappu rice is good too with mango pickle, and vadagams or pappad. Seasoning with red chili makes this tomato Pappu complete. In a pressure cooker, add washed toor dal, chopped tomatoes, shallots, peeled garlic and ginger, slitted green chilies, hing, turmeric powder, and red chili powder. Add 2 cups of water, pressure cook to 4 to 5 whistles. After the pressure releases, open the lid, mix well and add salt. Heat the seasoning pan, add oil, temper with mustard, jeera seeds, urad dal, red chillies, and curry leaves. Add this seasoning to cooked dal and mix well. Add some finely chopped coriander leaves to it and serve with hot rice drizzled with ghee. Daal is an integral part Indian food. Your spicy Andhra tomato dal seems delicious but in North India we can not tolerate so much heat of chili. What should I do so that the basic taste of this recipe is maintained.